After countless hours of rigorously testing in the real world racing environment, in order to achieve the desired results, we decided to release our own pulley set. Achilles Motorsports S54 Underdrive pulleys are designed and manufactured in the USA from 6061-T6 aluminum then hard anodized for durability and corrosion protection. Under-driving the accessories (water pump, power steering pump, and alternator) will free up wasted energy(horsepower) and will reduce the wear of the accessories by slowing down to a lower desired speed. This helps by eliminating the parasitic loads on the engine, which in turn sends more power to the rear wheels where it counts! Your engine will rev faster due to less loads from the accessories. The size of each particular pulley was determined after a lot of testing, making sure that each accessory component speed is reduced to a calculated and safe operational speed under race conditions. Dyno tests have shown an increase of 10-11 hp and 8-10 ft/lbs of torque at the rear wheels with no additional tuning. That is free horsepower! 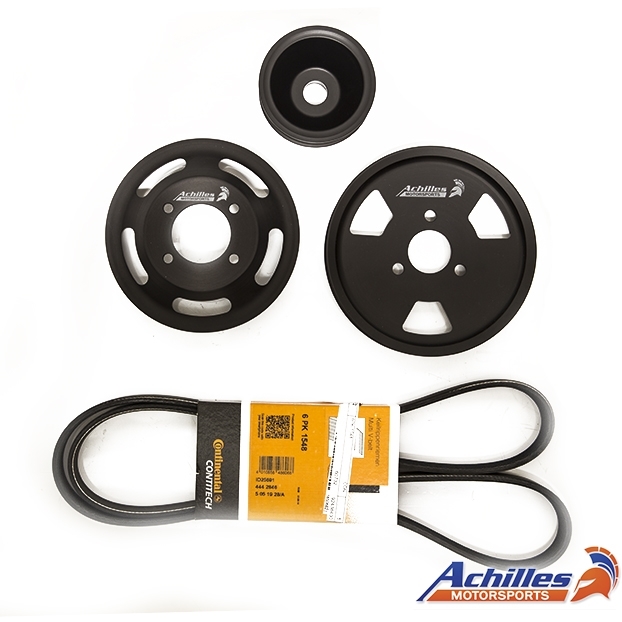 Our pulley kit will underdrive the accessories speed by 15-20%!